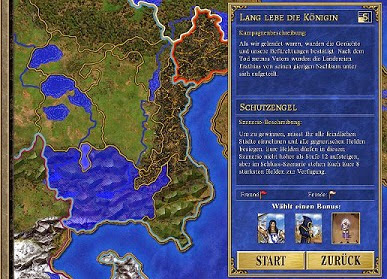 In this Might and Magic Heroes 3 HD Edition game guide we cut our way through the campaign more split the game in its HD remake. Each of the three campaigns has three scenarios that need to win. With our guide you can see from the screenshots, where certain things are on the maps. Note: Cheats disable the achievements on Steam! Win Condition: conquer the city Terraneus (underworld). Heroes rise no higher than on level 6. The four strongest heroes are accepted with a win in the next scenario. The (X) marks our selection. First, you should recruit outside the gate with the Christian soldiers. So you've ever put together a small army. Then go into the city and build from first. Important here is the "town hall" to upgrade to get first right on money. Links beside the town hall you can in the tavern a second (or more) to hire heroes against gold. Equip these heroes with some troops, and searches the area to the north. Here you will meet from time to time on opponents. If they want to escape, then let them flee and provoke no unnecessary fight. Collect all here and try as soon as possible in the north to conquer the next lock. Take from the chest before getting experience points to quickly move up to level 5 or 6. 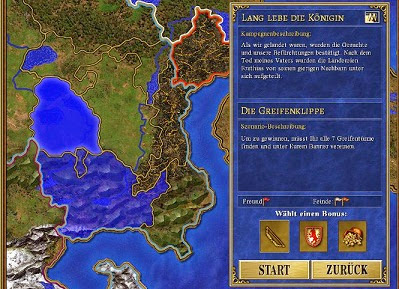 Have you captured the city here, also equip them fully and recruited some soldiers here / creatures for the next step. On top of your site because there are the entrance to the underworld (in the southwest is also one available). 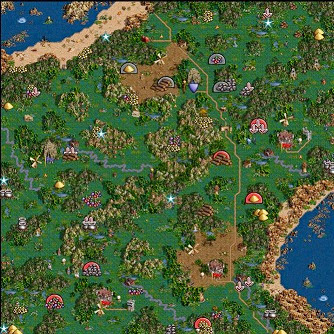 Take your best heroes and all his army occupied slots (let the safety always a hero in the cities back - New recruits if necessary). 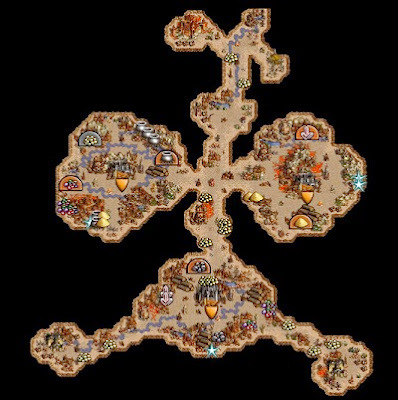 Then run into the underworld to the south and you come to Terraneus. This lock should be guarded by any opposing hero - so attack. Do you have problems here, it is also very, very useful if you have many archers or monks about to attack from a distance. Also Griffins are doing well because they can overcome the opposing walls. 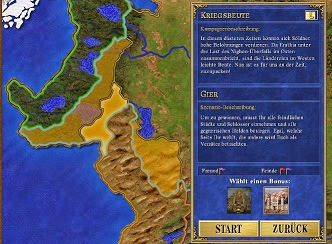 Win Condition: conquer all cities. Defeat all enemy heroes. Heroes rise no higher than on level 12. The eight strongest heroes are accepted with a win in the next scenario. You should take a first open in the middle of the small map. Your strongest hero is the angels who can stand around there at no cost to incorporate his army. So take all the angels in the immediate area and spread it evenly on your Heroes. Occupy the city and leave the safety of a hero there and build the first town hall. 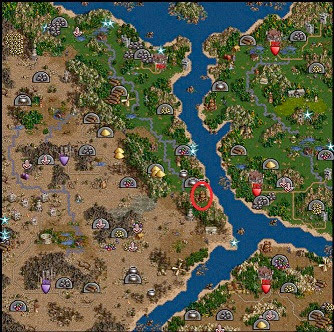 With the remaining heroes you should explore the map. Grade the West is lucrative. In the North West (blue circle) is an artifact "angel wings", which you give unto the seer (blue circle, center), to get 10 angels. Most opponents here should tremble before your army strength. If this is not the case, then watch it, that you present your angel, as they are a very strong unit. Should heroes open up in the upper world, then seize them quietly at times and try to do. Remember that you should always recruit troops in your castle (and for defense) to offer later stronger enemy heroes Parolie. The four cities are distributed evenly across the map. 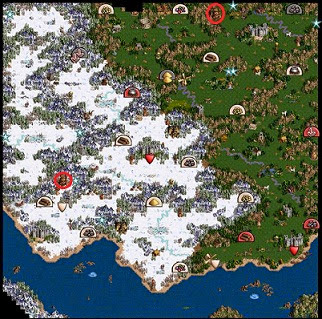 With three or four heroes in the Underworld (which you all an army of angels + other units) can begin cities to siege. The remaining enemy heroes can eventually cross your path and you have to fight - that's why it is important that every hero has a balanced and strong army there. Also don’t forget that a hero holds the position in the upper world in the castle. If you don’t you have eight heroes, then recruit the siege of the castle last even to the maximum to take them all in the next scenario. If the last attachment overrun (what angels are great! ), Then it goes into the third and final scenario of this campaign. Win Condition: Conquer All Seven Gripping Towers. The seven gripping towers (red) are located in the north. The first thing you should win for you the three castles in the south. Start first on market places and storage silos and then the rest. 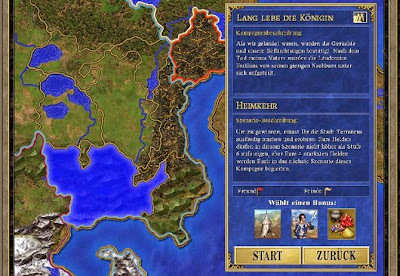 With your best heroes, such as Christian, you should explore the surrounding area and nick all of artifacts and resources. Build your army gradually - take your time and never try to make a city unprotected. The enemy heroes don’t sleep! 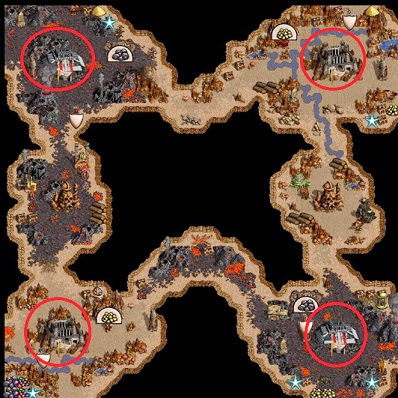 Besieged the Inferno (yellow triangles) brings you this before resting in the upper world. Here you should as usual increase your army before you move on to the underworld to do the rest of the opponents. There are only three infernos that should siege. With angels, this should not cause major problems. Once done, you can move to the upper world. If you have not yet taken the top locks, you can do that now. The last step will be to siege of the towers - which is a well-equipped with army, which should include angels, easy to master. Win Condition: conquer all mines. Heroes rise no higher than level 12. The eight strongest heroes are you in the last scenario. Build in cities put up a few recruitment facilities and equip your hero with the units. Hire the best yet a second hero to explore the surrounding area and to let go with all the treasures and plunder. Later, the Gorgonenlager and Wyvernnest are important fixtures that can enhance your heroes. In the south you are a magician, information about the location of all cities. Now it's time to conquer systematically. Buttoned you, starting from the first attachment that cities play in front of the west and east, before you slowly but surely should go to the south. 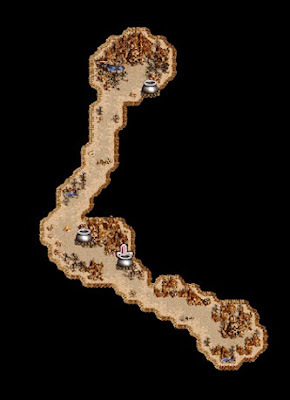 All cities are occupied, you have no more enemies and you can search by the mines at rest the whole map. 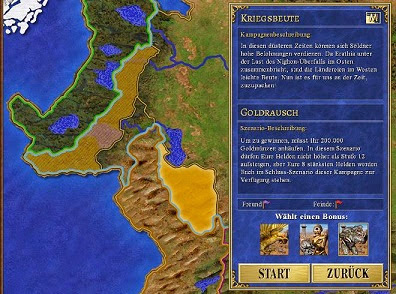 Win Condition: 200,000 gold coins save up. Let you down in the first castle, and incorporates them first a little off. Hires another hero on the map and explore a little. Make your way from south to north in front and take with especially the raw materials in order to quickly build more stuff in the castle can. In the north, west of the river, you should take the lock as soon as it has an adequate army. Also builds here, especially the town hall to generate and armies stationed in your previous castles every day some money. With the remaining heroes you can still exploring the East and nicked a few chests and items. 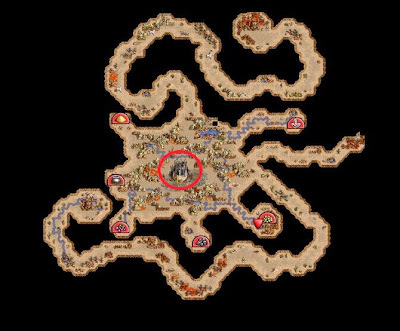 With your strongest hero, it then goes to the underworld (red circle). In the underworld you take everything that is not at three in the trees. From here you come to the north and south of this underworld again to the upper world. Is she here now to the south, you come to the southeastern castle in the upper world (take!). Do you guys go north, you come to on the northern island. Visited here the red tent and you get in the Northwest access to rich 90,000 gold pieces. If you do still manages to occupy the castle, the better. Generates now simply pass through the rounds, day after day money until you have 200,000 pieces together and the second scenario also ends. Win Condition: All locks are taking. Defeat all enemy heroes. You have three cities available. Step into her and she builds first from as far as it goes. With your hero, you should explore the surrounding area anyway. 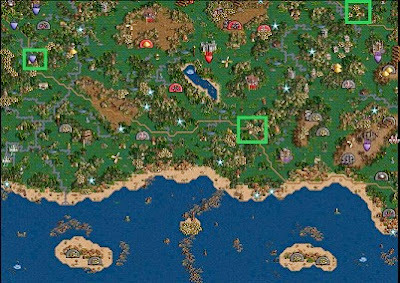 Do you have a reasonably powerful army garrisons attacks (green squares). 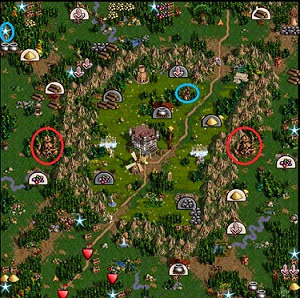 With other units should equip your heroes you to gain a foothold in the center of the map. Take care, if possible, to each opposing hero who roams. Ultimately conquered the remaining locks and let the troops reinforcements to deceases. 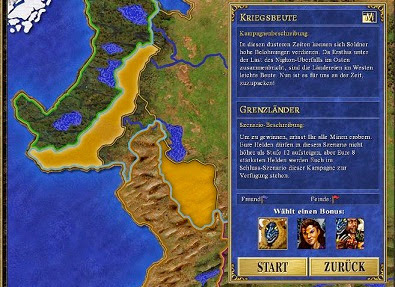 With the final victory, you have successfully completed this scenario.